3/4" Patterns available in XS,S,M,&L. Solid Colors for Underground Containment Collars are available in 3/4" and 1" widths. 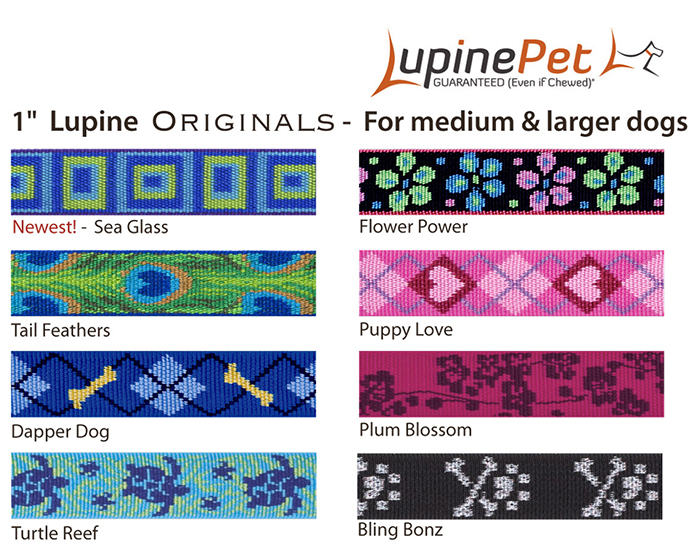 Our other collars (non-Lupine) will be 5/8" - 3/4" widths. Please take a minute to accurately measure your dog's neck. The fit of your dog's Receiver is directly relative to effective containment. 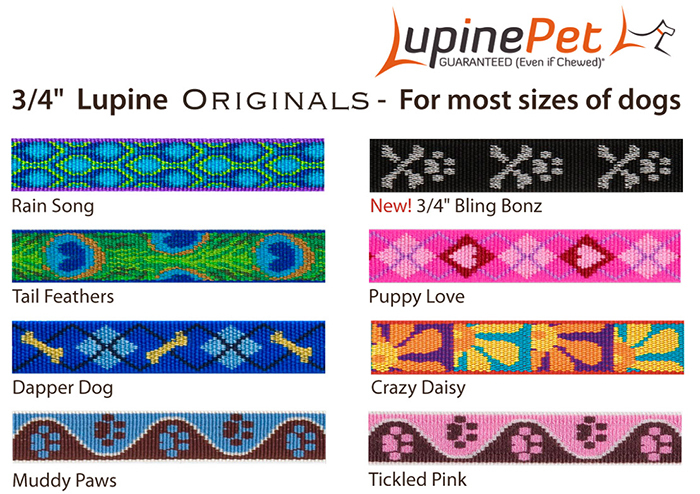 Lupine® Collar to fit most brands of electronic fence receivers (see drop-down menu). Collar Size X-Small 9"-12" Small 12"-17" Medium 16"-24" Large 19"-31"
For international shipping rates, please Contact us with your location information. E-mail us with your selection(s) if you prefer to pay via Check/MO. All brand names are the registered trademarks of their respective owners. Leather Brothers® and OmniPet® are registered trademarks of Leather Brothers, Inc. Invisible Fence®, Invisible Fencing®, Petsafe®, Radio Fence®, Safe Dog®, Powercap®, Invisible Mask®, Invisible Gate®, Invisible Power®, Off Limits®, Pet Keeper®, Shields®, ProLiteT®, R21®, R51®, A12®, MicroLite®, and Computer Collar® are registered trademarks of Radio Systems Corporation. Dog Guard® is a registered trademark of Sunward Electronics, Inc. DogWatch®, SafeLinkT, and Pet FriendlyT® are registered trademarks of DogWatch, Inc. PET STOP®, Perimeter®, Safer By DesignT, SmartReceiver®, UltraElite®, and UltraMax® are registered trademarks of Perimeter Technologies, Inc.